LONGMEADOW — Doctors, nurse practitioners and physician assistants will treat illnesses and injuries quickly — without a trip to the emergency room — at a new urgent care clinic run by Baystate Health at the Longmeadow Shops. The location, Baystate’s sixth urgent care clinic, opened Monday. With five treatment rooms, a medical laboratory and X-ray lab, the new Longmeadow Shops location can handle all the everyday — or not-so everyday — maladies that often send folks to an emergency room but do not have to: colds, coughs, flu, fever, sore throat, upper respiratory problems or asthma, minor cuts or burns, rash, skin, and eye infection, urinary tract infections, earaches, migraine headaches, strains and sprains, stomach pain, nausea, diarrhea, vomiting and some animal bites. Costs vary according to insurance coverage, but Baystate says a patient might pay a $50 copay at an urgent care compared with a $500 copay at an emergency room. 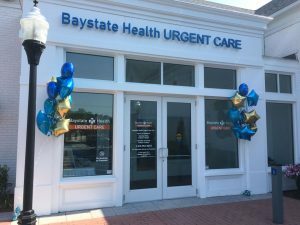 Baystate Health Urgent Care Longmeadow will be open Monday through Friday 8 a.m. to 7 p.m. and Saturday & Sunday from 8 a.m. to 5 p.m.
No appointment is necessary, but patients can hold a spot in advance at baystatehealth.org/services/urgent-care. The 3,000-square-foot urgent care clinic is on the western side of the plaza, near Longmeadow High School and the town’s athletic fields. The shopping center has long had medical offices, including an orthodontist and a pediatrician today. Urgent care used to be a matter of calling your family physician and dropping by the office, said Dr. Mark A. Keroack, Baystate Health’s president and CEO. But doctors offices have changed and family doctors are often too busy to see someone. Some people do arrive at urgent cares with injuries and ailments that require treatment at an emergency room or trauma center, such as strokes and heart attacks. in those cases, staffers at the urgent care stabilize the patient and get them transported to an emergency room via ambulance, Sutton said. “It happens every day,” Sutton said. Sutton said he came to Baystate five years ago when it took over Noble Hospital in Westfield. He ran Noble urgent care clinics in Westfield and Agawam under both Baystate and Noble. While Baystate has urgent care clinics, this is the first such clinic in Longmeadow and the first for Baystate’s partner, Shields Health Care of Quincy. Sutton said Shields manages the the Longmeadow clinic. Shields provides imaging services like MRI, PET/CT, and radiation oncology at more than 30 locations in New England. Managing this location for Baystate is its first foray into urgent care. Bill Demianiuk, chief operating officer of Shields Health Care, said Shields wants to run more clinics with Baystate.